When you think of mighty warrior robots that can transform into vehicles (and other things) most people would immediately think of the Transformers range. There’s no doubt that this brand captured the market, spreading from toys to cartoons to videogames to Hollywood movies. However, there were another set of contenders for the robot toy crown, and they were the Gobots. Gobots actually started life in Japan (where else) as the Machine Robo series of toys, slightly before the Transformers even came into existence. In 1983 western toy manufacturer Tonka licensed the toys for the US market, and renamed them Gobots in the process. Sales of the toys were initially very good, as the concept resonated with many a young lad. However, when Hasbro launched Transformers the Gobots suffered. This can be attributed to many things, but ultimately the Transformers toys were just a whole lot cooler. The Transformers looked more robotic an futuristic in many cases that their Gobot cousins, and they had better names too. Where the Transformers had Optimus Prime and Starscream, Gobots had Scooter and Tank (no prizes for guessing what they transformed into). If you were one of those Child of the 1980’s that were actually born in the Seventies, then you may remember a range of girls toys named Holly Hobbie. Holly Hobbie was not actually a toy range first and foremost however, in fact the rag doll style characters bearing the name were actually originally conceived for use on greetings cards. There are a surprising number of toy lines which started off this way, with the Care Bears and Rainbow Brite being two other examples I can think of off the top of my head. Another interesting fact about Holly Hobbie is that the name for these old fashioned looking characters actually came from the artist that created them. Denise Holly Ulinskas was the artist in question, who married a man named Hobbie and so became known as Holly Hobbie! When she originally sold her designs to American Greetings the character had no name, so Holly’s name was used to refer to the images, and I guess that name must have just stuck. The Holly Hobbie characters always had a little air of mystery about them, since most of the time they were drawn side on or from behind, and very little of the face (if any) was visible due to the large bonnet worn on the head. Obviously when the toy line was started the doll had to have a face, but it was always the bonnet, rag doll style dress and brown boots which took precedence. 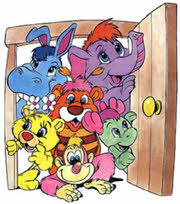 The Wuzzles was an animated series made by Disney in 1985, and given it only managed to notch up a single series of 13 episodes obviously was at the back of the queue when the usually Disney magic sparkle dust of success was being handed out. It first aired at around the same time as Gummi Bears, another series aimed at a similar target demographic. The Gummi’s managed to do a little better for themselves that The Wuzzles, but only slightly. So what on Earth is a Wuzzle then? Well, a Wuzzle is a creature that is a mix of two regular animals. For example there was Bumblelion, who was a mix of a lion and a bumble bee. In appearance he looked pretty much like what you would expect a anthropomorphised cartoon lion to look like, except he also had antennae, wings and a stripy stomach. Other characters from the Isle of Wuz included Rhinokey (rhino and monkey), Eleroo (elephant and kangaroo), Hoppopotamus (rabbit and hippo) and Butterbear (butterfly and bear). These were all good guys, but of course there has to be bad guys, the main villain being Crock, who was somewhat bizarrely half crocodile and half dinosaur (though which particular dinosaur I don’t know, though I wouldn’t be at all surprised if it was a Tyrannosaurus Rex – it usually is). I think my first encounter with a Smurf wasn’t with the comics or even the cartoon series, but with the little plastic figurines of the Smurfs that were given away as part of a promotion with a petrol garage. Wikipedia claims it was BP, but that’s only partly right. It was actually a chain of garages called National, which admittedly BP happened to own, but as far as the general public was concerned it was National. They even had a little musical slogan “you’ll get service with a Smurf“. Thanks to Kitty’s Cavern for clearing this one up for me. There obviously wasn’t a National garage close to us though, as I remember we only had a couple of the freebie Smurf toys. 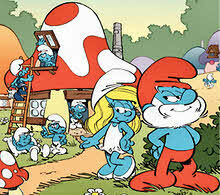 My sister had a Smurfette one, and I remember having a Smurf that was black instead of blue. It always puzzled me at the time why he was black, but in this case I have to thank Wikipedia for putting my mind at rest, as the black Smurf was actually a blue Smurf who was bitten by a fly and went a little insane. He was the central plot for one of the Smurf comics. Before National used Smurfs as a promotional aid though, I had never heard of them, despite the fact they were actually created way back in 1958 by Belgian cartoonist Peyo. Whilst they are known in Belgium as De Smurfen, which is where the English name for them comes from, they were first given a French name, Les Schtroumpfs. This odd name came from Peyo asking a French friend to pass him the salt at a meal, but he had forgotten what the French word for salt was, so said “pass me the schtroumpf” instead. This led to Peyo and his friend continuing their conversation substituting the word schtroumpf in place of other words, thus inventing the manner in which the Smurfs tend to speak, substituting the word Smurf for other verbs and nouns. Whilst you could normally work out what they were saying from context, “I’m smurfing my smurf to the smurf” could mean anything really. 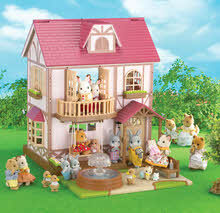 Before I go to far I have to admit I always thought of Sylvanian Families as a toy from the Nineties, but no, it is indeed a product of the Eighties. I think the reason I think this is because it did enjoy a period of high popularity at around the same time as things like the Ty Beanie Babies, mainly due to adults starting to collect toys proactively. The Sylvanian Families range of toys harks originally from Japan, and comprises a number of sets of animal families, all anthropomorphised to look more human. For the most part the animals are of the woodland variety, so there are bears, squirrels and hedgehogs, but you can also get dogs, cats and even penguins. The dolls stand at around 10cm high, and are covered in a very short flock material to make them feel furry. Unusually for this sort of toy, though in keeping with itâ€™s name, you buy the dolls in family sets usually consisting of mother, father, son and daughter. They are even given a family surname. However, whilst the animal families are a big part of the appeal of Sylvanian Families, the big draw for many is the huge range of additional things you can get to go with the dolls. The concept behind these toys actually owes more to old fashioned dolls houses then to collectable figures. 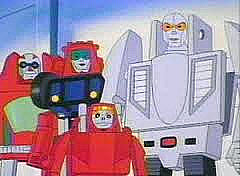 Some cartoon series in the Eighties were notable for being more a glorified TV advert for a range of toys rather than just a piece of children’s entertainment, and M.A.S.K. was no exception to this. This doesn’t mean that the cartoon wasn’t good, indeed far from it, as a poor cartoon is not likely to make kids want the accompanying toys, is it? M.A.S.K. was a high action cartoon aimed squarely at young boys, and can best be described as a mix between Transformers and Action Force as it featured cool looking vehicles that could transform into even cooler looking vehicles, and a group of highly trained action men and women. 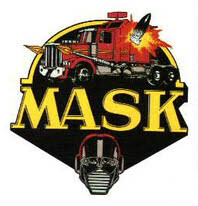 As the dots in the name suggest, M.A.S.K. was an acronym. It stood for Mobile Armored Strike Kommand (how Kool is that?) which was an organisation intended to fight crimes that were carried out by the also acronymed group named V.E.N.O.M. (Vicious Evil Network Of Mayhem – so no mistaking them as the bad guys then!). Both M.A.S.K. and V.E.N.O.M. were made up of experts in various different fields, each of which drove their own appropriate vehicle. When the need arose, these special agents could don a special piece of head gear (a mask, see, the acronym works on two levels) and their vehicle would transform itself into something with a bit more oomph, whether that be in speed terms or just extra firepower. Real Transformers On Their Way! The Transformers toy range is one that most people will be familiar with, either through the toys themselves, the cartoons or the more recent Hollywood movies or one of the many other forms of entertainment they have been adapted to. There’s no denying it’s a really cool concept, and it appears it’s one that may actually be about to become reality. Boffins in America (no, not Japan as you might have expected) have released news that they have a working prototype of a real Transformer, that can transform from robot mode into a drivable car in the blink of an eye. 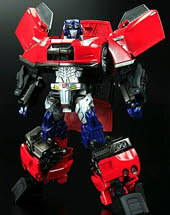 Not only can the car drive around, it is also possible for the robot mode to walk, albeit with a bit of a stuttering pace at this stage, though the makers are working on this. One of the most successful toy lines of the 1980s was the Cabbage Patch Kid, and whilst the toy itself was undoubtedly the main draw for young children, its appeal was boosted by the gimmick of having each doll come with an adoption certificate, supposedly making the young owner the legal guardian of the doll. Unsurprisingly this idea didn’t go unnoticed for long, and soon other toy manufacturers were doing similar things in order to make their toys seem that little bit more desirable to kids. The Pound Puppies range is one such line of toys that repurposed this idea and perhaps helped make the toys more popular than they might otherwise been. 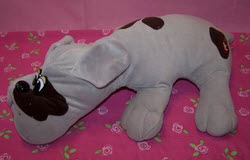 The Pound Puppies were soft toy dogs who, to be honest, looked more than a little sorry for themselves. They were made in a lying pose, with their legs coming out of the sides and their head resting on the floor too, just like a real dog lying on the floor having a snooze. They had big floppy ears (a bit like a Bassett Hound) and had a rather bored looking expression on their faces.